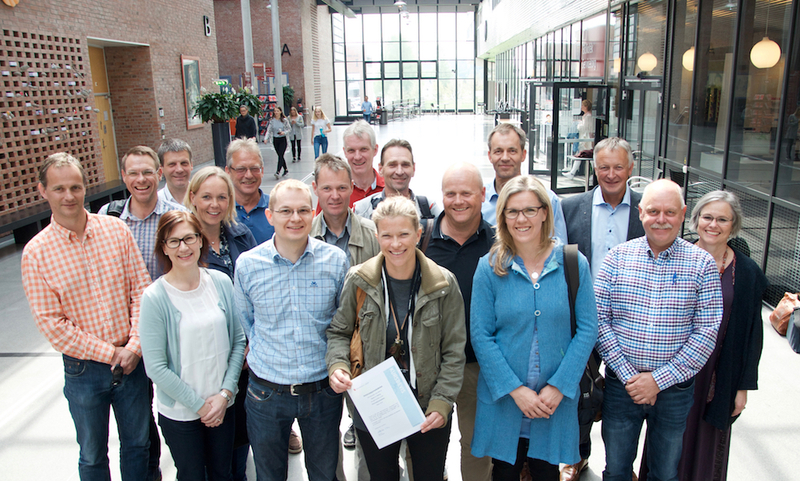 New Innovation Managers include, front row (left-right): Erik Moster (Norsafe), Marit Dolmen (GCE NODE), Mads Bjørnenak (Stimline), Ingrid Liv Helling (National Oilwell Varco), Kristine Wikander (Qmatec), André Torkelsen (entrepreneur) and Anne Mari Graver (Aust-Agder library). Back row (left-right): Christian von der Ohe (Castor Drilling Solution), Peter Gundlach (Management for projects), Marie Borgen (Nymo), Bjørn Saltermark (GCE NODE), Trond Friisø (Origo Solutions), Jeffrey Roberts (KSMV), Bjørn Viken (National Oilwell Varco), Hans Jørgen Mørch (CFD Marine), Gunnar Semb (Norsafe) and Svein Erik Mykland (Offshore Wind Industries). Not present: Katarina Kjelland Sørensen (Cameron), Eivind Gimming Stensland (MacGregor), Terje Bronebakk (Maritime Protection) and Philip M. H. Pedersen (Sweco Norge). 21 participants from 12 NODE companies recently completed a university level course in Innovation Management. GCE NODE initiated the course, which was offered by the Business School at the University of Agder. Main lecturers were Tor Helge Aas, Arne Isaksen and James Tommy Karlsen. Guest lecturers included entrepreneurs and CEOs from RedRock, Air Products, Quickflange, Otechos, Nøsted Kjetting og Voca, as different parts of the course were hosted by NODE companies in Tvedestrand and Mandal. “Half the group has chosen to submit a paper within six months. This will give them 10 credits towards a master’s degree. We are very happy with this group and the level of interest and enthusiasm the participants showed”, says Project Manager Bjørn Saltermark at GCE NODE. This course was supported by Sørlandets kompetansefond, Regionalt Næringsfond Arendal, Grimstad og Froland and Listerfondet.